This Persian yogurt dip with shallots is an absolute favorite of mine. It can be served with rice dishes, bread or all by itself. It is so tasty, creamy, flavorful and refreshing. Yogurt is a well known health food as it is an excellent source of probiotics, high quality protein and calcium. It is associated with prevention of osteoporosis, lowering of high blood pressure, contribution to gut health and fullness. Make sure to get yogurt with live and active cultures. The flavor of shallots is so subtle, sweet, mellow and somewhere between onions and garlic. But not nearly as pungent. There is little wonder why this is so popularly used in French cuisine. The beauty of shallots is not limited to its taste and flavor alone. Shallots contain allyl sulfides – compounds that lower blood pressure and inhibit tumor growth. Quercetin, an anti-inflammatory, antioxidant is present in high levels in shallots and has been shown in studies to reverse age related memory loss. Research has revealed that the phytochemicals present in shallots may contribute to better regulation of blood sugar and cholesterol levels. 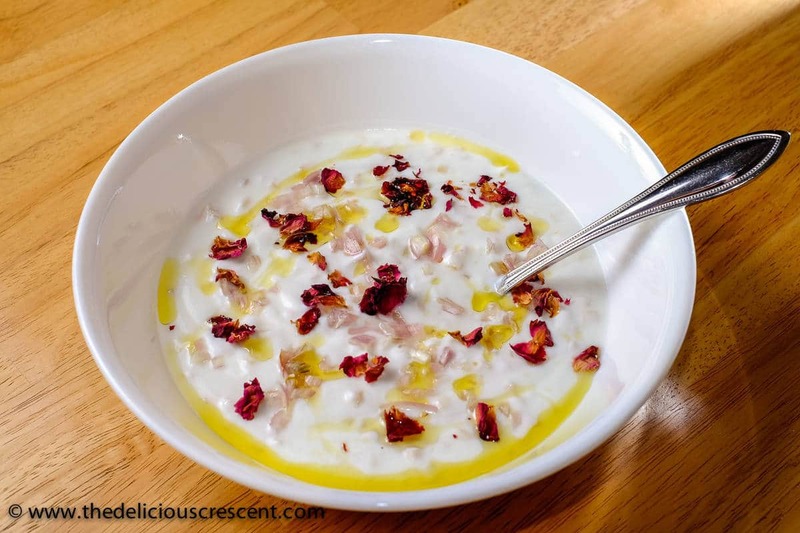 So get set to tantalize your taste buds with this Persian Yogurt dip with shallots! This can be served with a rice dish such as Saffron Yogurt Rice with Spinach and Prunes. What kind of yogurt dips or salads do you make? 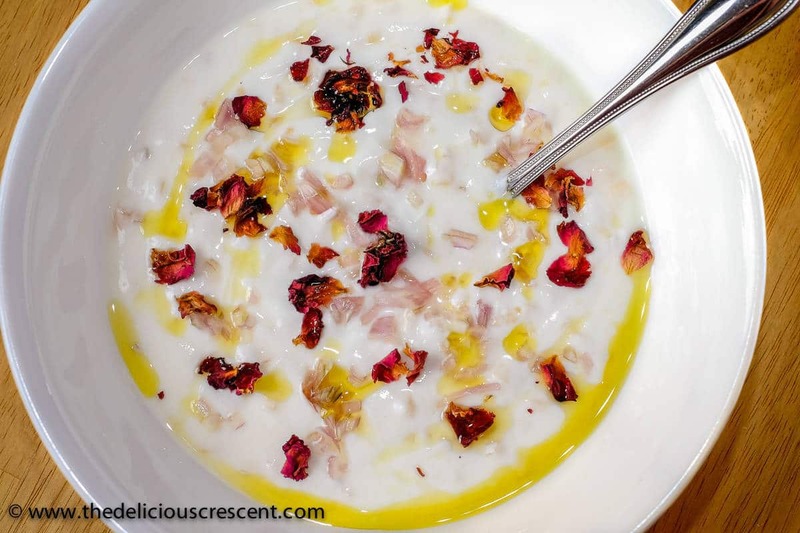 Did you try this “Persian Yogurt Dip with Shallots”? Peel and chop the fresh shallots. If using dried shallots, boil 2 cups of water and pour it over. Let the dried shallots soak until soft. Drain and soak a couple more times and rinse it well. This will help get rid of the strong flavor, if there is any. Add the finely chopped shallots to the yogurt, salt and mix well. Adjust as per taste. Transfer to a serving bowl. Cover and let it chill until served. The flavors meld well when it is left to chill for some hours. 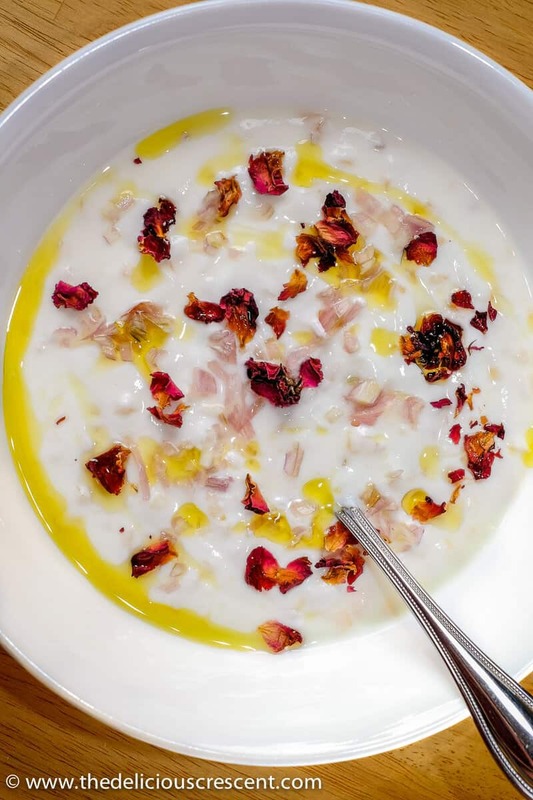 To serve, may drizzle some olive oil and sprinkle rose petals on the top.